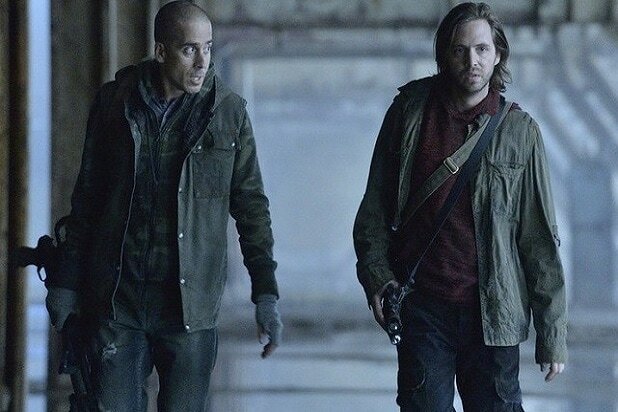 Syfy has renewed sci-fi drama “12 Monkeys,” which is based on the film of the same name, for a second season, which is expected to air next year. The second season of the time-traveling thriller, which stars Aaron Stanford (“X-Men: The Last Stand”), Amanda Schull (“Suits”) and Kirk Acevedo (“Dawn of the Planet of the Apes”), will see a shakeup in the producers’ roster. With executive producer Natalie Chaidez preparing her next Syfy series “Hunters,” Terry Matalas and Travis Fickett, who co-executive produced and wrote the “12 Monkeys” pilot, will serve as executive producers and showrunners of the series. Atlas Entertainment’s Richard Suckle (“Suicide Squad”) and Charles Roven, who served as producer on the original film, will continue to executive produce, with Atlas’ Jake Kurily producing. The current first season of “12 Monkeys” has reached 15 million viewers, with its most recent episode on March 6 attracting 1.5 million total viewers, a 6 percent increase over the previous week.